Through the same form of fire, the bodies of individuals were regenerated, by the burning - through the application of the rays from the stone, the influences that brought destructive forces to an animal organism. Hence the body rejuvenated itself often, and remained in that land until the eventual destruction, joining with the peoples that made for the breaking up of the land - or joining with Baalilal at the final destruction of the land. As one can see, this firestone did about everything. Not surprisingly, plans were made that indicated how to construct this firestone. Because these construction plans were of such great importance at that time in history, an effort was made to preserve them and to locate copies to safer locations outside the realm of the catastrophe that was unfolding on what was left of Atlantis circa 10,600BC. As to describing the manner of construction of the stone, we find it was a large cylindrical glass (as would be termed today), cut with facets in such a manner that the capstone on top of same, made for the centralizing of the power or force, that concentrated between the end of the cylinder and the capstone itself. As indicated, the records of the manners of construction of same are in three places in the earth, as it stands today: In the sunken portions of Atlantis, or Poseidia, where a portion of the temples may yet be discovered, under the slime of ages of seawater - near what is known as Bimini, off the coast of Florida. And in the temple records that were in Egypt, where the entity later acted in cooperation with others in preserving the records that came from the land where these had been kept. Also the records that were carried to what is now Yucatán in America, where these stones (that they know so little about) are now - during the last few months - BEING uncovered. It is interesting to note that, of all the places where the construction plans were taken, only two, Yucatán and Egypt, are on dry land. With the firestone being "the active principle" in "overcoming...gravity itself" is it any wonder that some of the world's largest pyramids and other huge monuments are located in these two areas? Also the records that were carried to what is now Yucatán in America, where these stones (that they know so little about) are now - during the last few months - BEING uncovered. (Q) Is it for this entity to again learn the use of these stones? (A) When there have come those individuals who will purify themselves in the manner necessary for the gaining of the knowledge and the entering into the chambers where these may be found; yes - if the body will purify itself. In '38 it should come about, should the entity - or others may - be raised. From the way the question was phrased (implying that the stones being uncovered, would have an actual use) it is my contention that the source Cayce was channeling, answered this question without regard for the phrase "...where these stones....are now....BEING uncovered". Rather, the question was answered honestly as to what Mr. 440 would have to do to learn how to use a firestone again, (purify yourself in the manner necessary so you can gain the knowledge and enter into the chambers where they are located). At that point, a clarification ensues which seems to point to the fact that only an emblem of a firestone (as opposed to a firestone one could actually use) is being uncovered in Yucatán. In Yucatán, there is the emblem of same. Let's clarify this, for it may be the more easily found - for they will be brought to this America, these United States. A portion is to be carried, as we find, to the Pennsylvania State Museum. A portion is to be carried to the Washington preservations of such findings, or to Chicago. So how does this quote support my belief that only the location of the firestone emblem was given? If you will notice, the location of the stone's emblem is "in the front of the temple, between the service temple and the outer court temple". In other words it's outside. 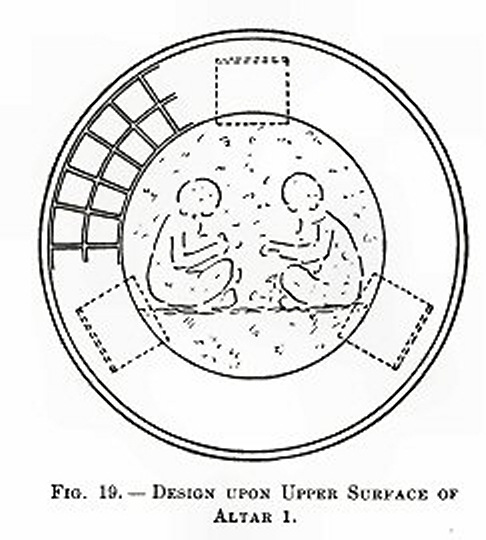 When Mr. 440 asks, if he is to "learn the use of these stones" being uncovered (thinking they were actual firestones, not emblems), he is told that he must purify himself for about 5 years [in '38 it should come about], then he will gain the knowledge for the entering into the chambers where these may be found. In other words the firestones themselves are located in chambers somewhere. Where these chambers are, wasn't given. 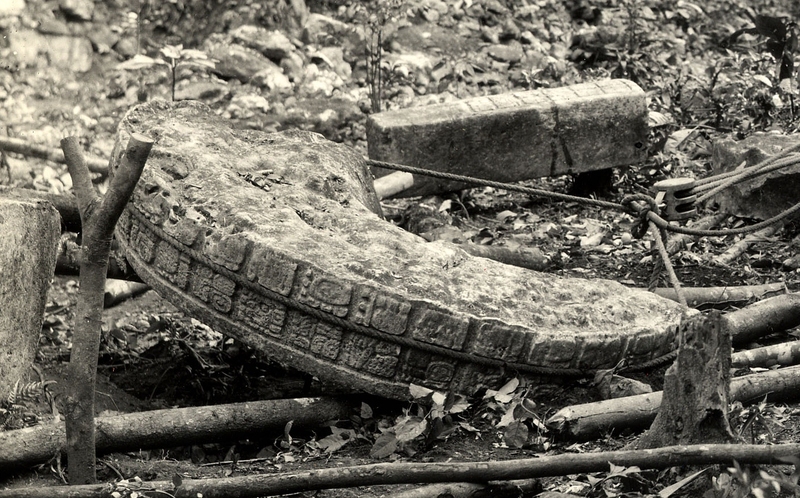 The emblem of the firestone, however, is located outside, in front of a temple in Yucatán. The two statements are mutually exclusive. It can't be "in front" of a temple and "in chambers" at the same time. Therefore, they must be talking about two different items. I think it is also clear that the source is not referring to "the records that were carried to what is now Yucatán in America, where these stones...are now being uncovered." The "where" in the "where these stones" phrase, I believe, refers to Yucatán in general, not to the actual specific place in Yucatán where the records were taken and stored. This seems to be the contention of those that are searching for a "Lost Hall of Records" in Yucatán. They believe the location of the emblem, as described in 440-5, must be the same place where the records "that were carried to Yucatán" are located. This is purely a leap of faith and nothing more than an assumption that is not supported by what Reading 440-5 actually says. (A) As given, that temple was destroyed at the time there was the last destruction in Atlantis. Yet, as time draws nigh, when changes are to come about, there may be the opening of those three places where the records are one, to those that are the initiates in the knowledge of the One God: The temple by Iltar will then rise again. Also, there will be the opening of the temple or hall of records in Egypt, and those records that were put in the heart of the Atlantean land may also be found there - that have been kept, for those that are of that group. The RECORDS are ONE. ...- in the varied portions of the land - which was much greater in extent until the final upheaval of Atlantis, or the islands that were later upheaved, when much of the contour of the land in Central America and Mexico was changed to that similar in outline to that which may be seen in the present. This proves, beyond any doubt, that any "lost hall of records" is not in the same location given for the firestone emblem. There is not even a mention anywhere in the readings of a "Hall of Records" in Yucatán, only a temple where the records were supposedly stored. When this temple by Iltar rises [it will rise again], THEN there may be the opening of those records. By whom? To those that are the initiates in the knowledge of the One God. This is not going to happen until the time is near (nigh) when the many earth changes detailed in the readings are to come about. All this could not occur in the 1930's, so the instructions that were given for the location of a firestone emblem, were just that, and nothing more. This statement is even more amazing when you consider that this is the main premise of the entire book. Also, the statement at the end of the previous excerpt, which starts out with the phrase, "that now being found", could not refer to Iltar's temple either, because it hasn't risen yet, and won't rise until "time draws nigh when changes are to come about". "That now being found" does pertain to the excavations that were then going on in Yucatán, and classifies the discoveries as belonging to a mixture of people from the older Lemurian groups that were already living in Yucatán, and the more recent arrivals from Atlantis. Where is the Emblem located? For later there arose (which may give a better idea of what is being meant) the activities of the Hebrews from this - in the altar that stood before the door of the tabernacle. The key phrase is highlighted in yellow. What follows this phrase gives a better idea of where the emblem is located. The emblem is located in front of the temple, in the same location as the Hebrews located "the altar before the door of the tabernacle." This, then, gives one a better idea of what is being meant when Cayce's source describes the emblem as being in "front of the temple, between the service temple and the outer court temple." THE LAVER was made of the copper looking-glasses which belonged to the women. The size of it is not known, but as all sacrifices were washed there before being offered on the altar, it must have been quite large. The one made by Solomon was called "the molten sea," and was about 16 feet in diameter. Priests passing to and from the holy place and the altar were required to bathe their hands and feet at the laver under penalty of death, and the high priest on the day of atonement had to bathe his entire person there before entering the Holy of holies. The laver typified Christian baptism. As the laver stood at the door of the tabernacle, so baptism stands at the door of the church. So how does this relate to Mayan ruins found in Yucatán? An example of what I think is being conveyed is found in Uxmal at the so-called Governor's Palace. In the courtyard (the outer court) are two altars. One is in the shape of a large cylindrical stone and is closest to the palace. The other, has a curious two-headed jaguar resting on it. The cylindrical stone would be in a similar position as the laver and the jaguar as the brazen altar. Some other perspectives of this arrangement can be found here. This gives us then, an idea of the kind of arrangement we can look for once we've determined where we need to look. The cylindrical stone is in the same location as a laver would be, and where our emblem should be. (Q) Who is conducting this work in Yucatán? (A) Would it be sent to any other place than to those who were carrying on same? (Q) How many facets did the crystals previously referred to have? (A) Would be better were these taken from the pattern of same that will be eventually put in the museum in Pennsylvania. At the end of the 1930s, The State Museum linked its survival to the fulfillment of its mission: to collect, care for, and exhibit the flora and fauna, history, archaeology, and fine arts of the Commonwealth. It managed to fulfill its mission not just with state appropriations, but federal dollars as well. Perhaps the most catastrophic effect of the Great Depression was in the area of personnel. In 1931 the State Museum had a staff of twelve—museum director, curator, assistant curator, exhibit preparer, taxidermist, three assistant taxidermists, two stenographers, lantern slide assistant, and general clerk. By 1933, at the depth of the Great Depression, the museum staff consisted of only three people: assistant director, curator, and exhibit preparator. (Q) Do you think it is wise to write the Pennsylvania State Museum, or called University of Pennsylvania, telling them of the crystals they will uncover in Yucatán in order that later they may be interested in an expedition to Bimini? (A) This would be well. Seek to find, through not divers [diverse] channels but through a regular channel from the university, as to who has led the expeditions in their recovering and restoration in part (for the better comprehension of that which took place) in Yucatán , and then communicate directly with that leader. It seems clear from this exchange, that the University of Pennsylvania (UPenn) is the organization that was conducting the work in Yucatán. If UPenn was incorrect, one would think that the error would have been pointed out. Not only was it not corrected, but Mr. 440 was told to contact someone from the university to find out who led the expeditions. Also, this museum is popularly known as the Penn Museum which could be easily confused with the Pennsylvania State Museum. It seems the source Cayce channeled did have a good idea as to what area in the US the expeditions in Yucatán came from, but was not so clear as to what organizations were backing the expeditions. We have the Pennsylvania State Museum error and also the source could not name the organizations from Washington or Chicago (A portion is to be carried to the Washington preservations of such findings, or to Chicago). ...as to who has led the expeditions in their recovering and restoration in part (for the better comprehension of that which took place) in Yucatán....". In other words, the term "uncovering" refers not only to digging out of the ground, but could also mean the recovery and restoration of the stones, (for the better comprehension of that which took place). This is an important point, because now the emblem does not necessarily have to be dug out of the ground, but just recovered and/or restored. This could mean, for example, that it might have been lying on the ground in pieces, and have to be put back together. Yucatán is the name of one of the 31 states of Mexico, located on the north of the Yucatán Peninsula. The term The Yucatán refers to the three states on the peninsula: Yucatán, Campeche, and Quintana Roo; all three modern states were formerly part of the larger historic state of Yucatán in the 19th century. Map depicting the larger historic State of Yucatán (circled) in 1840. Small yellow dot at the lower left edge of the black ellipse encircling the Yucatán approximates Piedras Negras location. Taking note of how interchangeably these geographic names are used in these two examples, I think it is reasonable not to put too stringent a definition on the term "Yucatán". Yucatán, in this reading anyway, probably refers to the entire Yucatán peninsula. If we proceed with these two assumptions, that the University of Pennsylvania is the correct organization, and Yucatán refers to the general area of the Yucatán Peninsula, we can then start our own "digging" for the firestone emblem. In 1930, the University of Pennsylvania Museum had decided to start excavating the Mayan site of Piedras Negras (PN) which is located on the Mexican-Guatemalan border. The Usumacinta River divides the two countries here, with PN being located on the Guatemalan side, a short distance from the river. A brief background summary of this expedition is provided by the Foundation for the Advancement of Mesoamerican Studies or FAMSI, on the Piedras Negras section of their website and I see no need to repeat it all here. They also have made available, many of the unpublished documents from those expeditions. These documents are a valuable resource in trying to determine what exactly was excavated at the Piedras Negras site and when it was excavated. When was the Emblem Removed? So instead of telling him what other stones will be uncovered, Cayce's source tells Mr. 440 that it would be sufficient to just tell the leader of this expedition to use "particular precaution" in the uncovering of the stone. The stone, then, is still there and not recovered as of January 10, 1934. It might be useful to remember that excavations at that particular site, can only occur in the dry season, which usually runs from March to June. The rest of the time it rains more or less constantly and you cannot dig. Therefore, the next excavations would have occurred in the early spring of 1934. There was an expedition that year, but no monuments could be removed during the 1934 field season, because the museum had inadequate funds to pay for the required Guatemalan inspector's salary. So the earliest the expedition could have shipped the emblem back to Pennsylvania is 1935. Anything shipped to the museum in Pennsylvania before 1935 would have to be eliminated as an emblem candidate. What does the emblem look like? 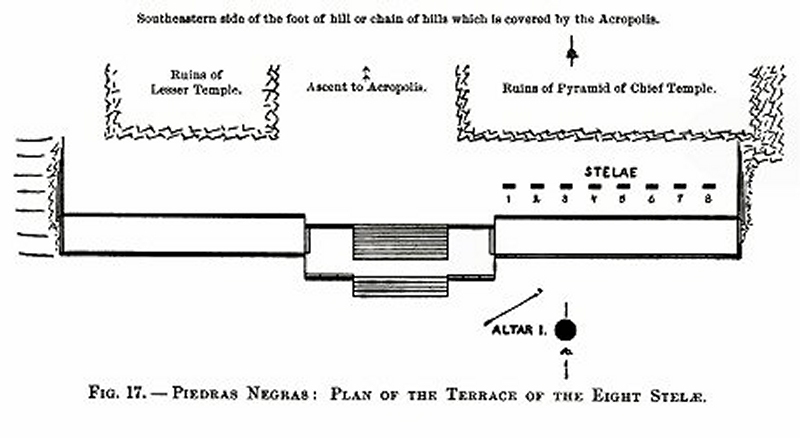 J. Alden Mason, the field director for the first two seasons (1931-32) of excavations at Piedras Negras, describes, in a 1935 National Geographic article, five "table top" altars found in various positions at PN (see below). 2, 3 All of these are much larger than the aforementioned altars and contain extensive markings and glyphs with the exception of Altar Five. 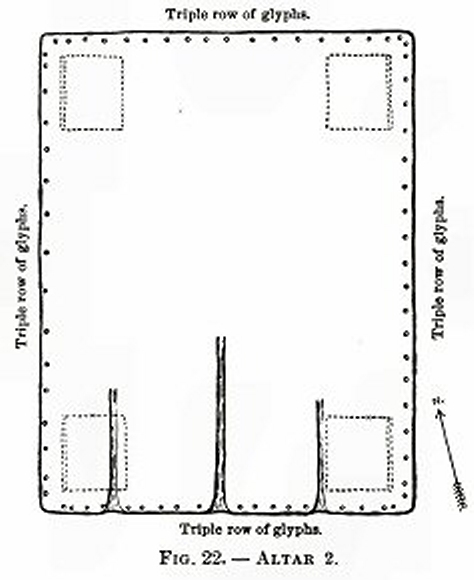 Table top altars are located at red dots and numbered 1 through 5. Reprinted by permission of University of Pennsylvania Museum. Altar 5 is one of the two round table top altars and was apparently found by the UPenn team laying "broken in pieces" at the bottom of the stairway of Structure O-13. There is very little information on this altar, but we know from Morley's The Inscriptions of Peten that it had no markings on it anywhere.4 This would seem to preclude it from being an emblem candidate as we should be able to count the number of facets that were on the crystal. It did lie directly behind Stela 14 which is also at the bottom of the staircase of Structure O-13 and this stela was removed and taken to UPenn. However, this object was removed from PN in 1931 and therefore could not have still been there in 1934 when reading 440-12 was given. Altar 2 is a square table top altar which has a triple row of inscriptions carved on all its sides. It does appear to be well-positioned in front of the J-2 stairway leading up to Court 1 which in turn, leads to Structure J-6 which houses one of the more important items discovered at PN, Throne 1. Being a square altar though, makes it a "tough sell" as an emblem of a firestone that was described as cylindrical. It also is devoid of markings on its face. While it is impossible to determine if the above excerpt is describing facets that were actually cut on the "capstone on top of same" or were cut in other parts of the crystal to create the effect that "...made for the centralizing of the power or force...". Either way, the possibility exists that there may have been facets cut on the capstone itself and, if so, Altar 1, could be representing this. This altar still lies at Piedras Negras in pieces. I also believe it is significant that this desire to transport Altar One was still alive in 1935, when the National Geographic article was published, (the photo was apparently taken in 1931), otherwise, why include it in the article? As explained earlier, the earliest any object or emblem could have arrived in Pennsylvania was 1935. Is Altar One Positioned as the Laver? So far we have determined that Altar 1 is a round altar that looks somewhat like a sundial, and could possibly have a representation of the number of facets carved on its top or face. But is it positioned properly as the "altar that stood before the door of the tabernacle"? 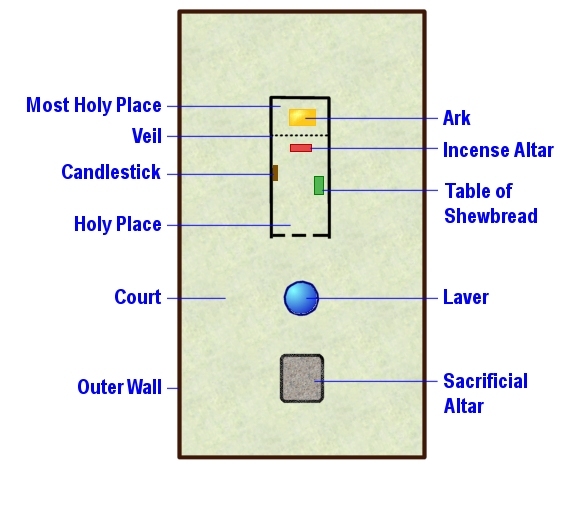 At first glance, looking at the map above, it would appear that it is not as well-positioned as Altar 2. 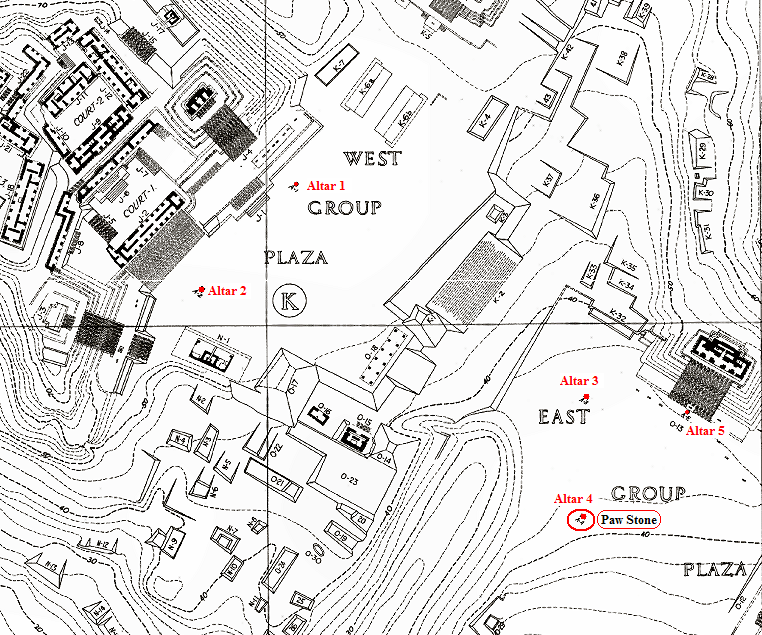 However this map is an overview of part of PN and the heights of the various structures cannot be easily ascertained. From these two drawings we can see clearly, that Altar 1 is well-positioned as the laver, the altar before the tabernacle door, directly in front of the large J-4 Pyramid, the most imposing structure on the Acropolis. Does Altar One Face an Opposite Chamber? From P-1 we may conveniently go around to the front of Pyramid O-12. This conforms to the general type, having had a single front stairway leading to a broad terrace at the base. In this case there are two terraces, one lower and in front of the other, obviously an adaptation to the terrain, which slopes from the pyramid's left to its right. Both terraces run parallel to the front of the pyramid. The front slope was cleared considerably in a search for lintels, which were not found. The lowest steps were intact in some places, with hard plaster on the adjacent portions of the upper of the two terraces. The inside of the temple was cleared, revealing a single room temple with three front doorways. A narrow sill, hardly a bench, ran along the rear wall on the inside. The width of the room, including this sill, was 1.8 m. Walls varied from 1.1 m (front) to 1.5 m (rear) in thickness. The roof was probably a stone vault, though the evidence for this fact was not recorded. 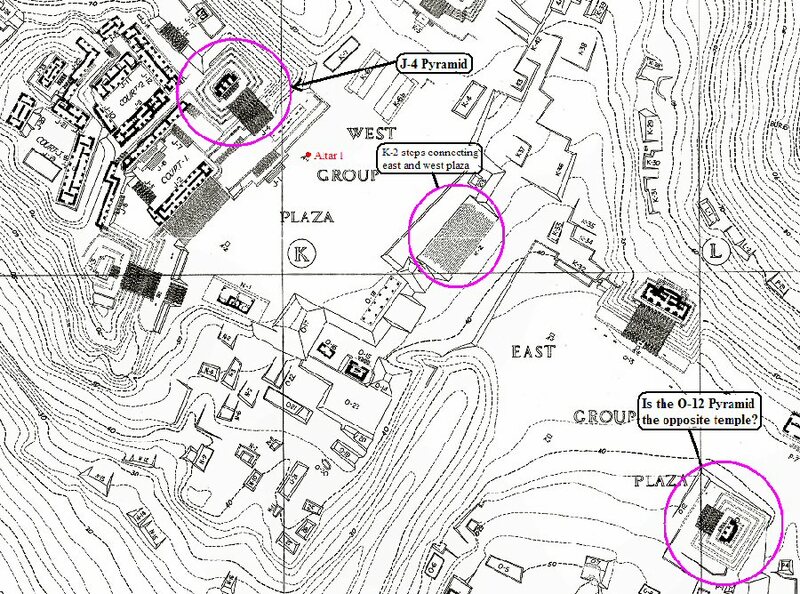 Expanding the above map to include both the East and West Group Plazas (below), we find that through the connection of the K-2 stairway, that Pyramid O-12 does indeed face its opposite, Pyramid J-4.11 There does not seem to be any intervening structures between the two buildings, so you could say that Altar 1 lies "between" the two, although certainly it is not halfway between them as you would commonly visualize them in your mind when reading this excerpt from 440-12. Opposite temples, O-12 and J-4, as viewed across East and West Plazas.Reprinted by permission of University of Pennsylvania Museum. Morley was not an intellectual. He was content to amass data, but showed little interest in using them to interpret Maya civilization. His energies were directed to deciphering the calendrical dates--his ability to wrest a date from a badly weathered stela was phenomenonal--but his concern for noncalendrical glyphs was so small that usually he did not trouble to draw them. While it is easy to dismiss these dates as "not historical", much of that may depend on your own personal view of what happened in our remote past. All of the previous points discussed throughout this article, point to the fact that an important stone at Piedras Negras, Altar 1, could be the firestone emblem alluded to in Cayce reading 440-5. 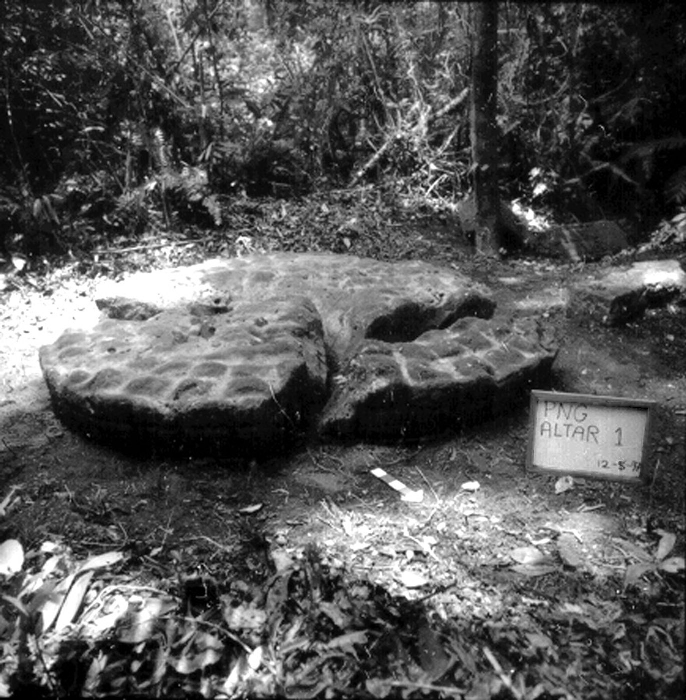 Altar 1 looks like a sun dial, and is located in the same position the laver was, in front of the tabernacle door. It is in front of one of the most important temples at Piedras Negras, the J-4 Pyramid of the Acropolis. Altar 1 also lies between the two opposite facing pyramids J-4 and O-12. Altar 1 has a double row of concentric hieroglyphs (33 in each row, 66 total) carved in a circle on its top that could represent the facets cut into the firestone crystal. This altar was supposed to be taken back to the University of Pennsylvania Museum in 1931 but, although an attempt was made to move it for export, for some unknown reason this was not carried out. There still, however, may have been some discussion among the UPenn researchers as to how to get Altar 1 back to Philadelphia after this failed attempt and the source channeled by Cayce may have picked up on this. Altar One also contains some of the oldest dates found at PN, spanning over 6000 years, many of which precede the start of the Long Count of 3114BC. This gives added weight to the possibility that Altar 1 may have been of ancient origin or at least represented something of ancient origin. Add to this, the fact that no artifact actually brought back to UPenn fits all of the criteria that was laid out in the two readings that deal with the emblem, and you are left with the strong possibility that Altar One was the firestone emblem. I would like to thank Jonathan Eagle for his uncanny ability to point out areas in this article that needed improvement and always challenging me about my assertions. Also, for his talent in making the article look terrific. A very special thanks goes to William Hutton whose unending patience, encouragement and support gave me the desire to pursue this subject to its conclusion. J. Alden Mason, "Preserving Ancient America's Finest Sculptures," National Geographic Magazine, LXVIII, No. 5, (1935), 569. Linton Satterthwaite, Jr., Mary Butler, and J. Alden Mason, "Piedras Negras Preliminary Papers," Piedras Negras Archaeology 1931-1939, (2005), 12-13. Sylvanus Griswold Morley, The Inscriptions of Peten, Volume III (Washington: Carnegie Institute of Washington, 1937), p. 25. Teobert Maler, "Researches in the Central Portion of the Usumatsintla Valley," Memoirs of the Peabody Museum, Harvard University, II, No. 1, (1901), 54. Morley, op. cit., p. 285. Mason, op. cit., p. 545. Maler, op. cit., p. 44-45. Satterthwaite et al., op. cit., p. 22. Van Auken and Little, op. cit., p. 133. Sylvanus Griswold Morley, An Introduction to the Study of the Maya Hieroglyphs (New York: Dover Publications, 1975), p. xi. Morley, op. cit., p. 286.